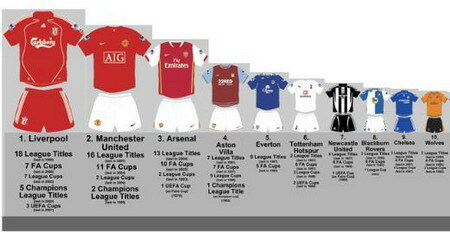 纵观整个英格兰足球历史，120 年以来的 “The Big Four” 当属 Liverpool, Man Utd, Arsenal, Aston Villa. Chelsea 只能排到第九，Everton, Spurs, Newcastle 和 Blackburn 都在它之前。曼联离 Liverpool 还差一次联赛冠军，两次欧冠冠军，当然 Liverpool 那三个联盟杯曼联看来是追不到了，-_-!!! SHOW! 曼联 08-09 新客场球衣，GIGGS 11!